Rev. Joseph T. Moos, CSV, died Oct. 23, 1979 at Hines Veterans Administration Hospital, in Maywood, IL — the very hospital where he had served as chaplain for 10 years — after a long illness. He was 67. Prior to serving at Hines, Fr. Moos was a missionary in Japan for 11 years, starting in 1955. Fr. Moos served in Kyoto, where the Viatorians had established St. Viator Church in Kitashirakawa, and Rakusei Middle/High School, starting in 1948. Fr. Moos remained in Japan until 1966 when he returned to the Chicago Province to serve wounded veterans at Hines. 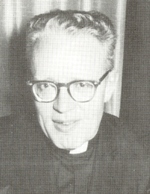 He retired as chaplain in 1976. In all, Father Moos was a member of the Viatorian Community for 44 years and a priest for 40 years. Visitation took place from 2-9 p.m. Oct. 24 at the Hines Hospital chapel in Maywood, where Chaplain Charles W. Strippy of the hospital gave the homily. A requiem Mass was offered Oct. 25 at St. Viator Church in Chicago. Fr. 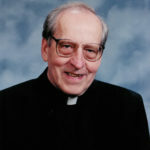 Kenneth Morris, provincial, served as principal celebrant and Fr. Eugene Lutz gave the homily. Bishop Nevin W. Hayes, auxiliary of Chicago, also presided at the Mass and gave the final commendation. Burial took place at Queen of Heaven Cemetery in Hillside, Illinois.